Wait. You're riding a Ducati from Mumbai to Chennai? Alone? I've heard they're unreliable! Should you not be on a BMW or something?" I encountered this group of riders at Shoolagiri, a popular stop about 80km from Bangalore on the stunningly good road to Chennai. I smiled and pointed out that this 13 month old Ducati was running past 15,000km at that point and that my faith in it had grown leaps and bounds. And I was home at a friends place in Chennai a full three hours before their estimate without trying too! Emphatic point made, yes? The last update. But let's back the story up. At the last update we had just completely the brake recall, cancelled the big trip to Kolkata and changed the gearing. 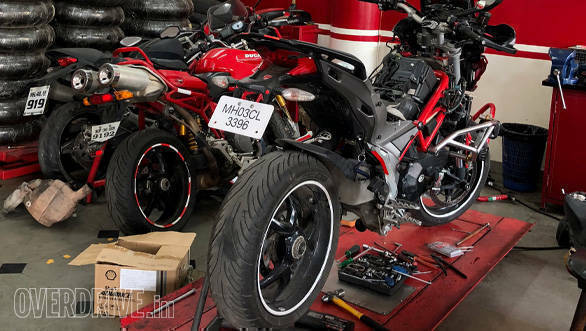 Because I was leaving for a big trip and since the last comprehensive (annual as Ducati likes to call it) service was back at 8,500km, I decided to ask Ducati Mumbai to run the bike through a thorough end-to-end check, replacing air filter, oil and oil filters along the way. Good call. The rear suspension lower mount was a but under the torque specification - fixed. We also discovered that the extra-rorty exhaust note was due to a four tiny cracks at the collector box exit. 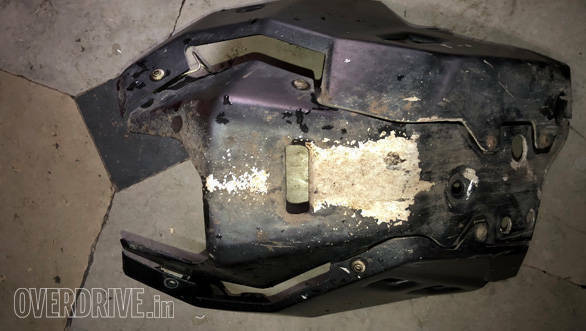 Ducati Service confirmed that only a handful of Multistradas in India seem to have these, possibly due to the state of our roads. Due to paucity of time, we argon welded the cracks over and they're holding so far. A warranty replacement will come later. Cost? 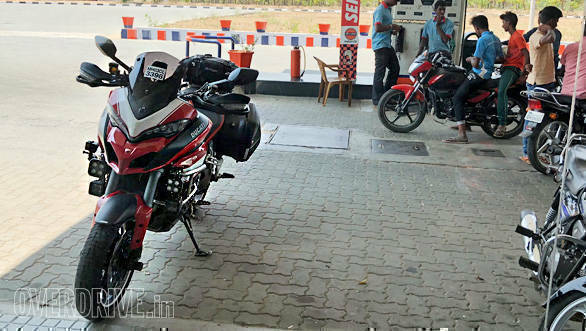 Excluding taxes, Rs 3,600 for the 4 litres of engine oil, Rs 2,400 for the air filter, Rs 750 for the oil filter, Rs 5,500 for the service and Rs 1,000 for the chain cleaner and lube. That is about Rs 13,500 approximately which rides to about Rs 16,700 with taxes. 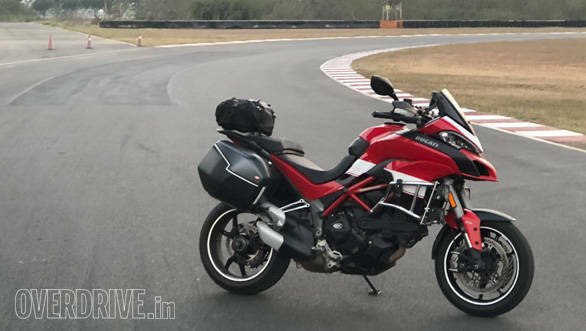 For reference, a regular service usually comes to about Rs 11,000 with taxes for the Ducati Multistrada. I'd briefly mentioned that the +4T rear gearing, about 10 per cent lower, produced a noticeably crisper, quicker and smoother machine. This time, I had 3,200km of highway to understand more. And the first thing I noticed was that the Ducati had become more fuel efficient. I normally fill well before it hits reserve and in that mode, I was riding 270-280km between fill ups with about 80km of range remaining according to the display. With the new gearing, on the same stretches of road, I find that I can now to 310-320km before I have to fill up, again with about 70-80km of range remaining. That is perfect for me because my formula for long rides at high average speeds means fewer stops. Even in the city, the range display hovers over 300km after a fill up a lot longer than it used to and I can ride almost a day or two extra before I feel the need to go top the tank up. This time, almost all the mileage is out on the highway and yet, economy is a stunning 19kmpl! And in riding terms, I'm able to pass traffic without needing any gearchanges at all most of the time while the Ducati feels more liquid and vastly smoother. 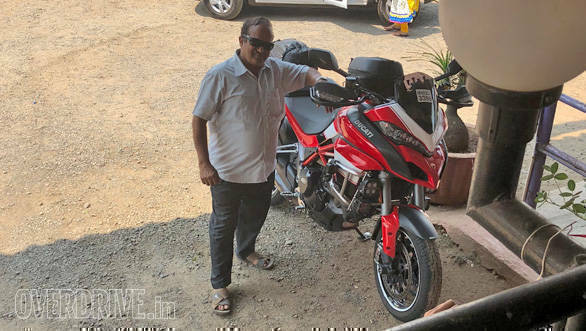 Anand Dharmaraj got to ride the bike on its end-of-life Michelin Pilot Road 4s and he had two things to day. First, the Michelins are pretty good even at 9,500km into their lives! He didn't fiddle with the suspension settings this time, but the Ducati has serious moves even on these old tyres! More importantly, he said, "The new gearing has removed the waiting. It was as if there as a short pause before the Ducati went ballistic earlier. With the new gearing, it's just flying everywhere!" I put in the ultra-short enduro-style Powerbronze screen to try and get some breeze into the mesh jacket in slow riding around the city. And this it does wonderfully. However, on the highway, the screen proved inadequate at providing fully buffet-free high speed cruising ability. Hence that cheap clip-on visor from AliExpress. 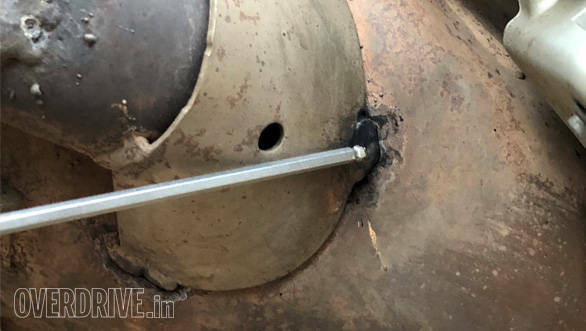 It costs only Rs 600 and it allows you to adjust for height as well as angle and I've already found a position that is vastly quieter and still extremely well-ventilated. I love the Michelin Pilot Road 4. It has no real off-road capability that doesn't bother me because I don't go off-road all that much in the first place. They've lasted a staggering 9,500km in my riding on a 150PS machine which is a record for me. 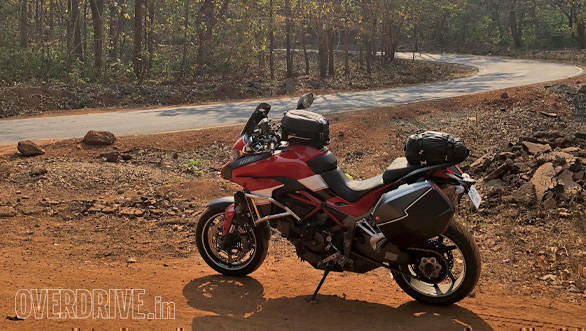 The tyres on my Triumph as well as the original Scorpion Trail IIs on the Ducati both wore out in 7,500-odd kilometres! But in another 1,000km, they'll be down to the tread wear indicators. I was very tempted to go back to the Scorpion Trail IIs. Pirelli India called to confirm that the OEs now source Pirelli and Metzeler tyres through them and therefore prices have come down. But at roughly the same price, PathPavers.in sent me a set of Metzeler Roadtec 01s which are rated as the top sport-touring tyre according to all the European and American reviews. So the next change, and this is a big one, is new tyres for the Ducati. The OE Scorpion Trails IIs would have been about Rs 28,000 plus fitting. The Metzeler Roadtec 01 is about Rs 26,700 excluding shipping and fitting. Just for reference, the Michelin Pilot Road 4s are about Rs 26,000. All prices current from Path Pavers at press time. New tyres, new destinations, and home-made grip pads!